Thanks for this post Ivan! I think I'll pay them a visit one of these days. How much do the shots cost? At magkano naman lahat yan? 1. The flu shots are P1000, but they're giving it at 20% off until March. 2. Typhoid vaccine is P1500 and good for 3 yrs. 3. Hepa A is P2700 per dose and you'll need 2 doses. That's good for 5 to 10 yrs. 4. Hepa B is P1250 per dose and you'll need 3 doses. That's good for 5 to 10 yrs as well. 5. Not too vital for local travel is cholera. It's P2100 every 2 years. And you'll need 2 doses. 6. Finally, meningococcal vaccine P1900 and you'll need shots every 3 years. I got the flu vaccine yesterday and a blood test to check if I still need Hepa A vaccine and B booster. Except for typhoid which is strongly endemic here, the others can wait until I go to Africa or South America. And if one does go there, it will do well to get yellow fever vaccine too. I got a shot in 2002 so I'm okay until 2012. Hehe! hey ivan, thanks for the very informative post. i got most of the vaccines listed above last year for a fraction of the price at the UP infirmary. :) wala lang might help some of your readers on a budget. I could imagine since government hospitals offer many services at a subsidy or at cost. I always get my regular blood tests at UP PGH since it's much cheaper. But I have to ask favors from people I know there to get me the needed requests. 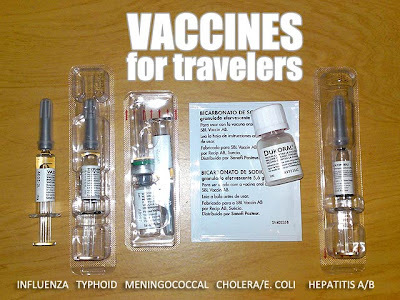 I strongly agree to vaccinations prior to travel. And if I may add, one can also consider a booster shot of Tetanus (otherwise known as lockjaw) which occurs when a wound gets infected by a bacteria called Clostridium Tetani living in the soil. I also received Yellow Fever vaccination for travel to the Peruvian Amazon which should be good in other endemic areas as well. There's a lot of travel-related health stuff that can be discussed but the bottom line is always prevention. was wondering if Flu, Cholera and Typhoid vaccines enough for these countries? hi ivan, a am ms. jiji crucillo, i am the general manager of livecare vaccination and treatment clinic. Our clinics renders adult vaccination too, at very low and affordable price. We are located 1110 Pablo Ocampo st. Malate Mla. We also give anti rabies vaccinatio prophylaxis for human. I would highly appreciate you will also promote our clinic. thanks and God bless. First of all thank you for this very informative post. We will be going to Philippines for the first time next month (July). I know about the flu & typhoid fever vaccines, but questionable about giving our kids the hepatitis vaccine. I was wondering how common meningitis, cholera & hepatitis are in the Philippines? anyone here know ehere ca i have my yellow fever vaccine?? ?